Valid only on 31st March 2017, 5pm to 8pm. 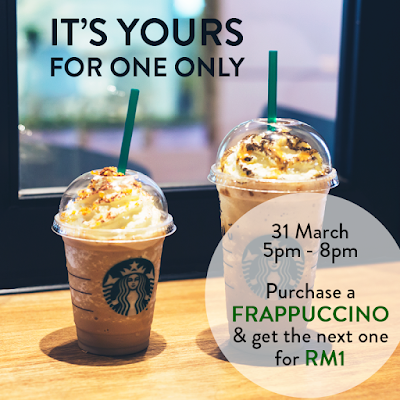 Applicable at all Starbucks stores except Genting Highlands, Tapah R&R and Sunway Lagoon kiosk. Not combinable with other discount or promotion. RM1 promotion applies to Frappuccino purchase that is equal or lesser value than the purchased Frappuccino. Modifier will be charged at regular price. RM1 for Tall, RM2 for Grande and RM 3 for Venti.